Overview : Unlike others, PS SAMURAI uses its own, custom programming software for PC and MAC; has a recovery function, very useful after a bad flash; uses 32KB on-board flash (majority uses 16KB); delivered with no code inside which means it is 100% legal; device is rubbercoated and designed to enhance protection and grip and can be afford by ordinary people. THIS DOES NOT WORK ON FIRMWARES 3.42 OR ABOVE UNTIL A NEW EXPLOIT/METHOD IS FOUND! IMPORTANT: The console must be completely switched off before using PS SAMURAI. For fat versions, use the switch at the rear. For slim versions, simply remove the power cable. This is extremely important for the process to work correctly when you start the console. USB Plug and Play solution that installs in seconds without any need to open up the PS3. Does not break your warranty seal. Compatible with all PS3 models*, both Fat and Slim. Supports all regions: USA, JAP, PAL and KOREA. Disables forced software updates and will never brick your console. Supports most games and homebrew applications. Easy-to-use software for backing up, managing, and playing games from external USB Hard Drive. Playing games from HDD is much more enjoyable, benefiting from greatly enhanced seek and loading times. 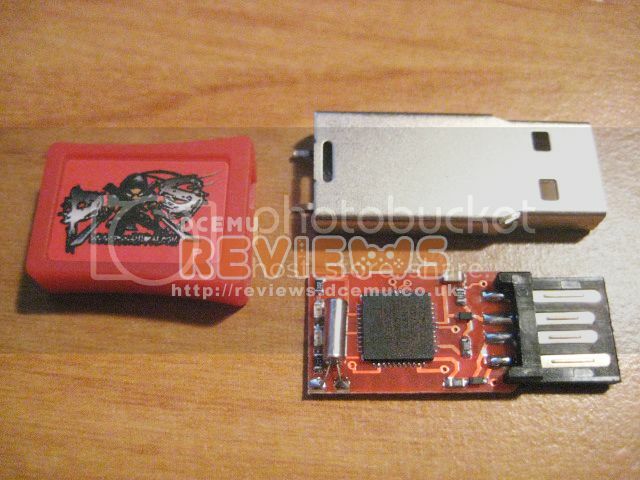 Supports installing homebrew application on PS3 and external USB media. Optionally PS Samurai can be supplied with an “open” firmware which does not support backup loading. Users would then have to download a firmware update for PS Samurai to get full functionality. Quality/Usability : The first thing that comes to mind when you look at PS Samurai (or atleast for me) is the infamous picture of the red dongle from PSJailbreak. I thought it was a mock-up image of PS Samurai's dongle but after receiving it, its not. PS Samurai comes in a small anti-static bag like majority of dongles that are being shipped out. The dongle is covered with a red rubber cover which not only protects the dongle but makes a great grip. The rubber cover can be easily slipped on and off. Removing the rubber cover exposes the metal casing. This casing itself looks exactly like the PSJailbreak, PS3Key and AVRKey. There is also no writing or logo on the housing. The dongle measures approximately 1.25" (length) x 0.50" (wide) without the rubber cap. Like the PS3Key and AVRKey, PS Samurai is running on ATMEL MEGA32U2 (ATMEGA32U2) and is upgradeable via USB port. The USB board also contains two leds; red and green. Red is for when the jailbreak is being performed and Green for when it is successful. Before you start, you MUST download Microsoft's Visual C++. Without this, PS Samurai's Upgrader software will not work and will give an error when you try and open it. Once you've downloaded C++, download PS Samurai's Upgrader software via link above. To get the PS Samurai into Update Mode, all you have to do is insert the dongle into the USB port on your computer. When it enters into update mode, no LED is lit up but when you open the software, it will tell you if the dongle is connected. You can also tell by the little pop-up notifications on Windows. I like how the PS Samurai Upgrader software is set up, however each time there is a new software file, you'll have to download the newest upgrader software for the latest updates. It would be convenient if there was an option to check for the latest software or files and download it over the software rather than go to their site and download the latest software. On the Upgrader software, you're able to load their own proprietary file (PSSAMURAI FIRMWARE), PSGroove HEX (.hex) files, Import payload (.bin) files or ERASE the files on the PS Samurai. So, if you want the latest updates, you can simply load the HEX files and than load PS Samurai files when it becomes available if you wanted to. To load the files, select the method you want to load your files whether it be PS Samurai's firmware, HEX files or importing payloads and select the file you want to load. Once selected, click on START and the software will begin to upgrade the dongle with the file you selected. Once completed, it will pop up with a message and click OK. Now, you're able to remove the dongle from the computer and into the PS3. I had no problems loading and getting PS Samurai firmware and importing payloads to work on the PS3 once loaded onto the dongle. However, I went to install a Minimus HEX file (similar board to AVRKey) on PS Samurai and the software said it was completed. Went to jailbreak the PS3 and I don't see the usual files and the LED did not light up on the dongle. So I went to plug the dongle back into the USB port and I hear no ding to state that the USB is plugged in. Loaded up PS Samurai Upgrader software and it says "DEVICE NOT CONNECTED". Ut oh! Unplugged and plugged it back in and nothing. So I thought, maybe I can try and get it into update mode like the PS3Key by inserting and removing it a couple of times. Nothing. It seems the dongle is completely dead and unrecognized at all. I even inserted the dongle without the metal case and still nothing. What is weird is that even if I load the Minimus HEX on the AVRKey, it works but not on PS Samurai even though AVRKey and PS Samurai uses the same chip (ATMEGA32). Even if I was to load the wrong HEX, I should still be able to erase it or overwrite the HEX with the correct one, but that's not the case. I informed PS Samurai of my testings and they passed this information to their engineering team. PS Samurai was able to send me another dongle so I can finish up my review and testings. If it wasn't for this problem and having to wait for another dongle, this review would of been the first review to be posted. Start up the PS3 and press the EJECT button. The LED (which should have been red initially) will change to blue. If the above process worked, there will be a link to “Install Package File” in the game menu. In order to make sure the PS Samurai dongle worked flawlessly, I had to uninstall all my homebrew applications that I had originally installed. To install applications or any homebrew applications, you will need to download and save the .pkg files to a USB drive such as thumbdrive or harddrive. To install, simply insert USB drive to the PS3 and navigate to "INSTALL PACKAGE FILES" on the XMB under GAME. Select the file you want to install by pressing X and it will automatically install the file. All applications installed and loaded without any problems. At the time of this review, there is no listing of distributors or sites selling the PS Samurai and no mention of price. However, I was informed that the price would be $25USD/piece. This is very very affordable and a great price range for those interested. Guests online: 479. Total online: 481.